Stew is one of those old fashioned comfort foods that most people grow up having strong feelings about. I have always loved the flavor of slow cooked or roasted vegetables in a flavorful sauce - especially with a crusty bun to sop up the juices with. The nice thing about a meal such as this is that it's a great meal to make ahead and tastes better every time it gets re-heated. Much like soup. I got my stew beef recipe from my mom who always made it on the stove. My friend, Doris told me that she makes hers in the roaster in the oven and I liked that idea because you can pretty well ignore it once it's in the oven. So, go ahead and try this recipe, either in a large pot on your stove, in your Dutch oven, or roaster in your oven. Trim and cut stewing beef into small, bite size pieces. Brown in oil, cooking and stirring as needed, for about ten minutes or until juices are gone. Add seasonings. Once the meat is browned and begins to sizzle, add onion and stir, cooking until onion is soft. Add water to cover beef and let simmer for about an hour. Add more water as needed to make sure it's cooking in a bit of liquid. Lid should be on with room for steam to escape. Add all of the vegetables, except for the peas. Mix tomato paste with 1 cup water and pour over the vegetables. Add bay leaf. Cook for another hour. Stir as needed and make sure there is always some liquid at the bottom. Add peas for last 15 minutes of cooking. Adding a flour/water mixture to thicken juices is optional. Spray Dutch Oven or roasting pan with cooking spray. Trim and cut beef into small bite size pieces. Put in roaster. Sprinkle with salt, pepper, paprika and flour to coat lightly. Drizzle with a little olive oil, stir. Roast open at 400° F for ½ hour. Add chopped vegetables, tomato sauce and bay leaf. Sprinkle with a little salt and pepper. Cover with lid and bake another 1 ½ hours, adding peas near the end. You may want to check it in between to see if there is enough liquid to your liking. Add more water if you like it runnier. That looks scrumptious and what a great idea to roast it in the oven! 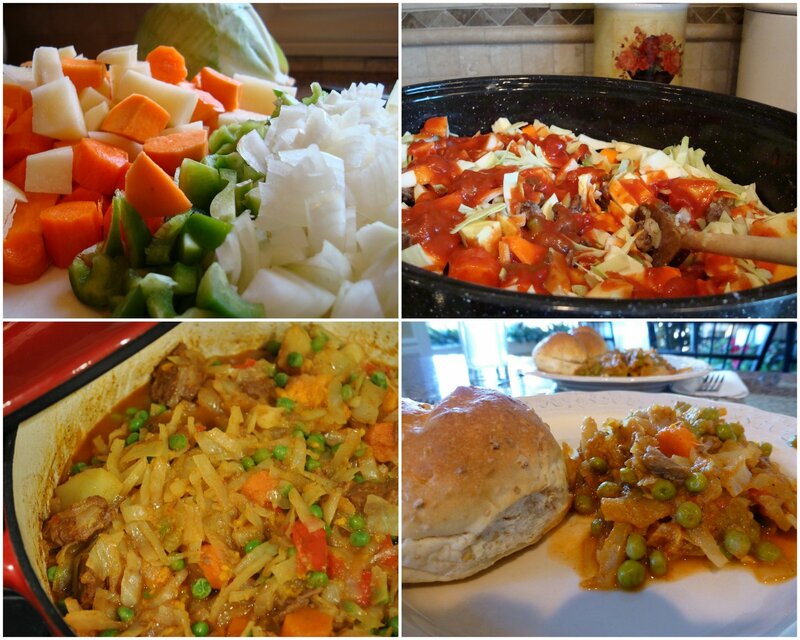 Love the addition of cabbage; it's been years since I've done that but I will definitely try it tomorrow night! Thanks, Anneliese!! I THIN K THIS LOOKS WINNER AND I HAVE SEEN MANY OF YOUR GREAT RECIPES. I will print it out when I can go upstairs to the computer with printer attached! That looks so cozy and comforting right now. Thanks for posting - I may have to try it is this weekend. Double batch would be help get into next week too. I also always make my stew in the oven, no fuss!! I like the 'in the oven' idea! I've never really made my beef stew with cabbage but since I love cabbage I definitely plan to try this recipe. Is a sweet pepper the same as a green bell pepper? A sweet pepper looks exactly like a green pepper, but it's either red, yellow or orange. They are considered sweet because they are quite flavorful just on their own on a raw veggie platter. This looks amazing! It would be perfect today as it is cold and rain outside! Could this be done in a crock pot ( slow cooker ) and how long would you set the timer for? I have not made it in a slow cooker, but you certainly could. I would probably still pre-brown the meat with onions in a pot first because I like a nice brown on the meat and the flavor it gives, but that is just personal taste. Stir to coat the meat with flour before adding vegetables. You could cook it on low setting for 10-12 hours or high setting for 4-6 hours. A stew can be cooked longer and still be good.